Want to fall asleep when listening to music on a Mac, and then have your Mac automatically stop playing music? You know, kind of like a sleep timer for iTunes? Well you’re in luck, Sleepytime does exactly that for Macs! 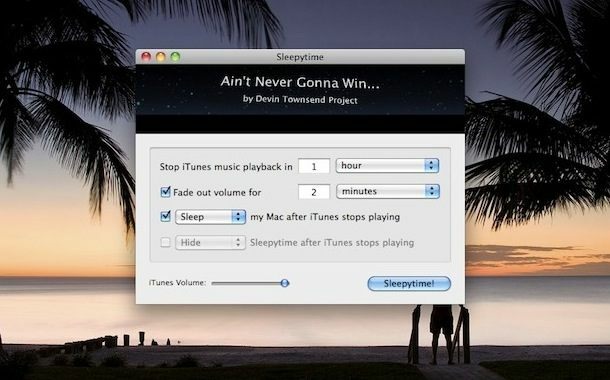 Sleepytime is a simple app that functions as a sleep timer for iTunes and your Mac. You set a time for iTunes to stop playing and then set a fade interval, and your Mac will stop playing iTunes gradually, before finally sleeping your Mac. Essentially how it works is that SleepyTime waits for the amount of time you specified, then fades out the iTunes app on the Mac. You can even set it to go further and sleep the Mac automatically too. Give it a try if this sounds appealing to you. And if you know of another better solution, then let us know! Thanks to Lifehacker for discovering this nifty app!